I have done this recipe a while back and I guess it’s now a good time to post this! I wanted to make something that would satisfy my ball park food craving. 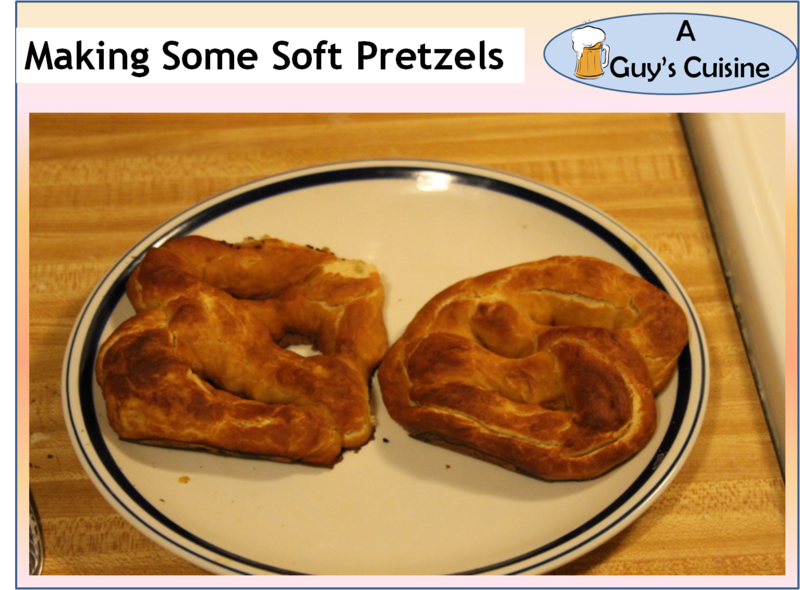 And soft pretzels are something you can make and enjoy as well! Sure it can be a bit time-consuming but this is worth making! Here is what you need. 1. Warm the milk than combine it with the yeast. Let yeast rise for 10 minutes. 2. 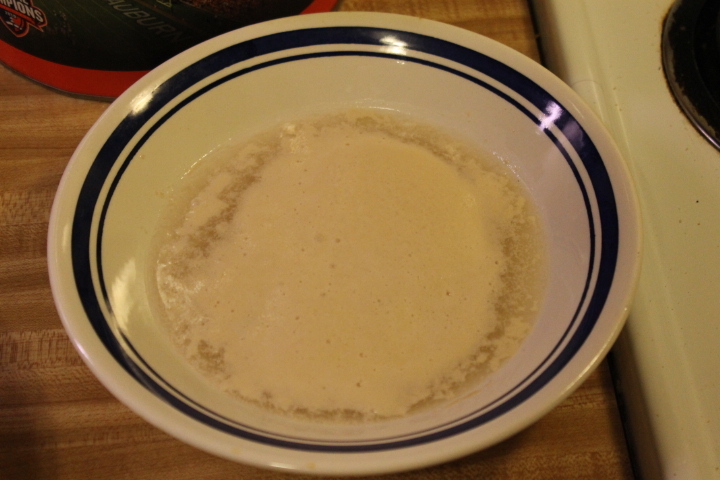 Combine yeast mixture, flour, brown sugar, 2 tablespoons unsalted butter that is diced into mixture, and tablespoon of salt into bowl. 3. Combine mixture well and then pour mixture onto floured surface. 4. Knead dough for around 5 minutes until dough is slightly tacky. 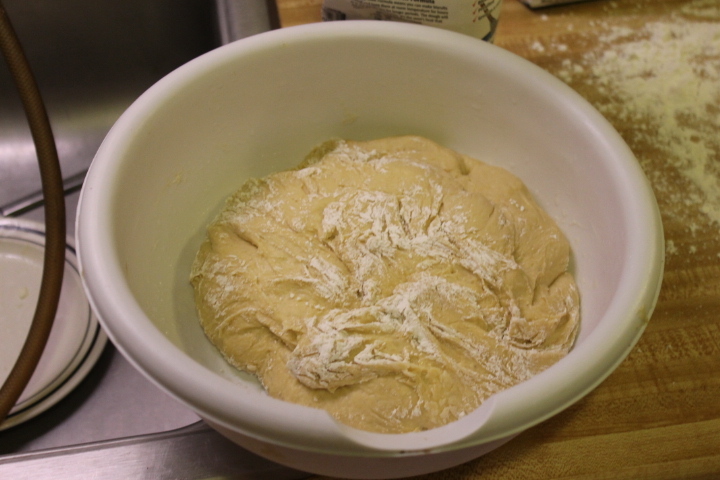 Shape dough into ball and place into greased bowl and cover with a wrap for towel. Let rest and rise for 1 hour. 5. Preheat the oven to 450 degrees. After letting dough rest punch the dough to deflate it. 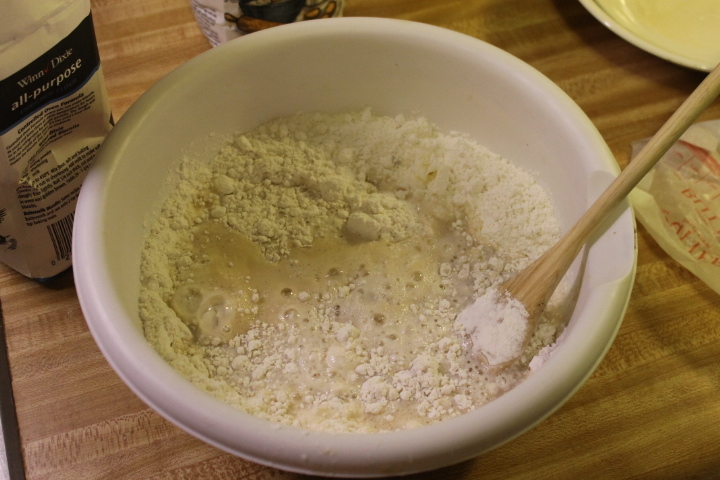 Divide the dough to 6 pieces. 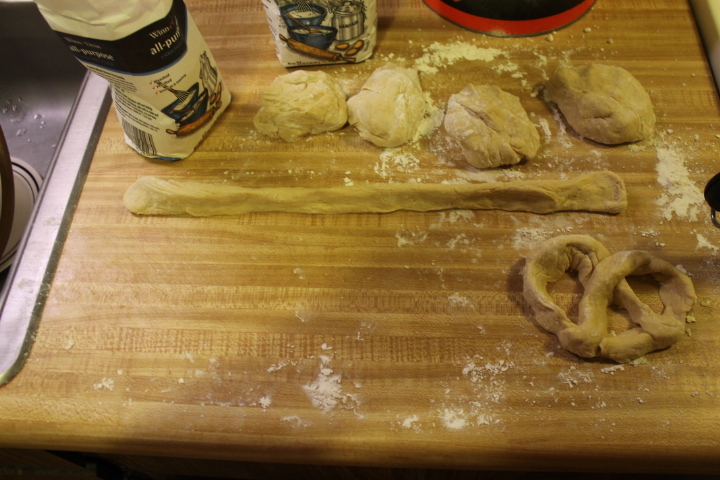 Roll out each piece of dough into a 30 inch rope. 6. 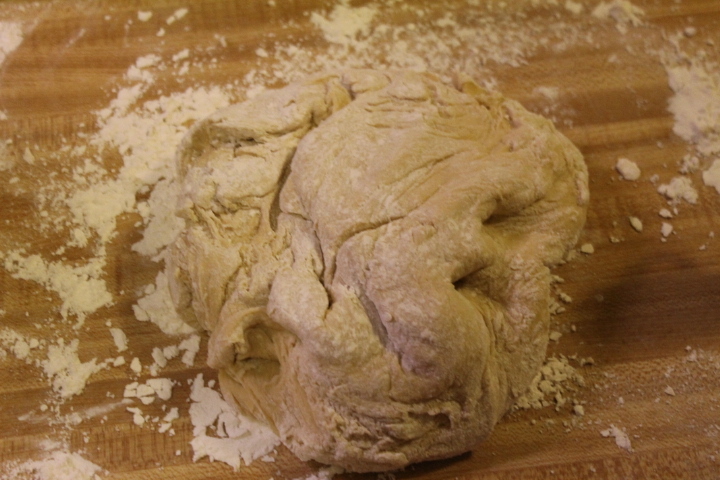 After rolling out the dough into a rope. 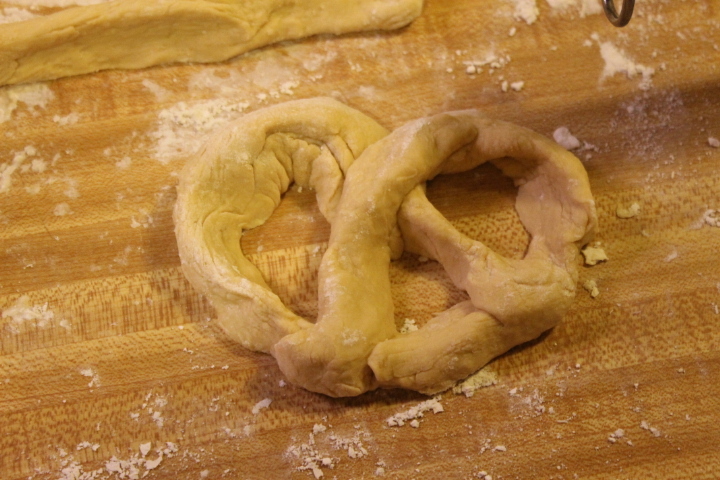 Form the dough into the pretzel shape. 7. 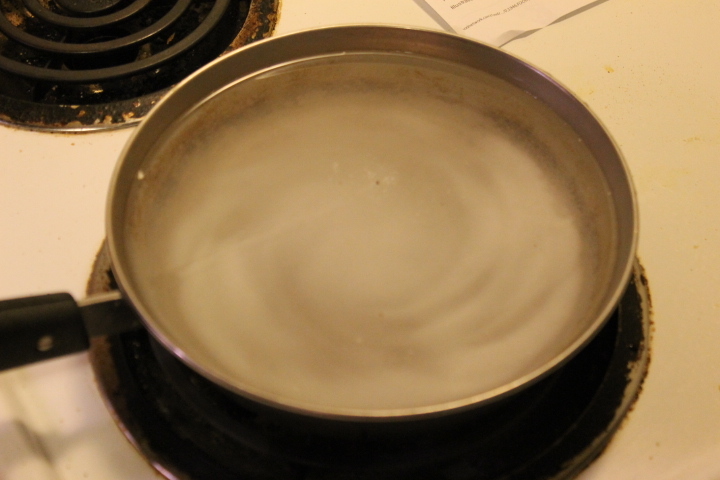 Combine 1/3 cup baking soda with 3 cups of water into saucepan. 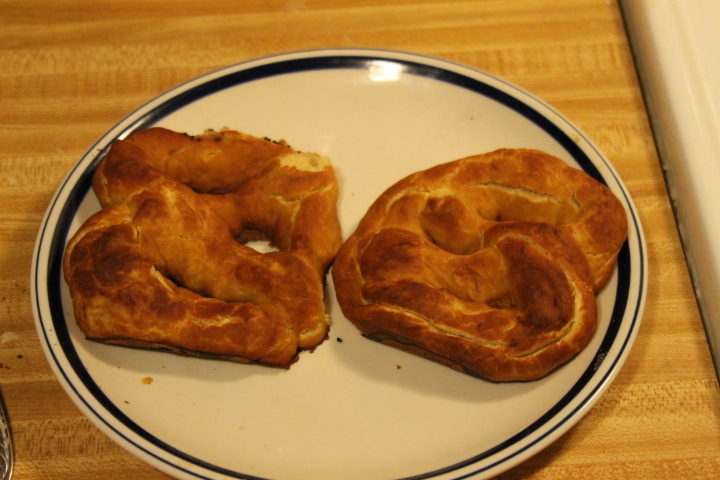 Dip each pretzel into the baking soda solution. Then put the pretzel onto a baking sheet. 8. 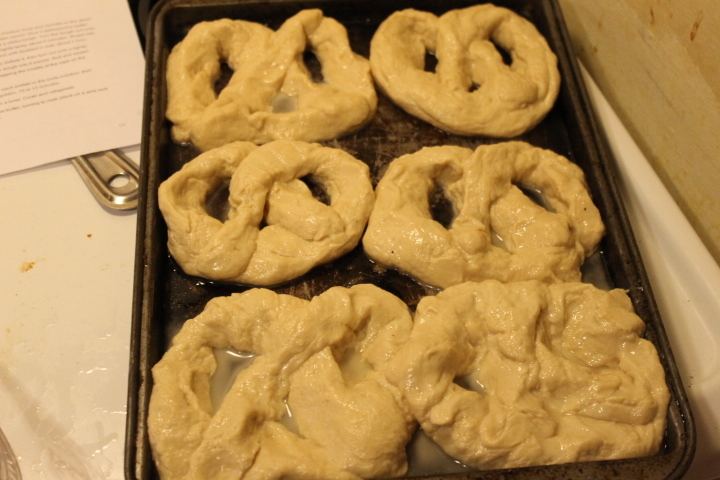 Bake the pretzels in a 450 degree oven for 10-12 minutes or until golden brown. 9. Take the pretzels out of the oven; then use 8 tablespoons of butter that is melted and brush the top of the pretzels with the melted butter. 10. 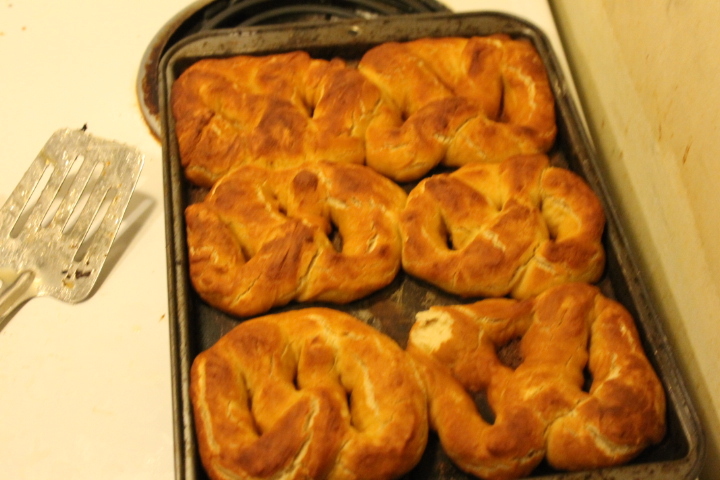 After brushing the pretzels with butter. Pour some course salt on the tops of each pretzel. Yes I did not put salt on my pretzels. The salt is optional but these were very good. These are better than the frozen pretzels you can get at the store. Enjoy!